Despite my rough starts, my pregnancy with Jack was very smooth. I experienced fatigue during the first trimester and struggled with just giving into it. I developed an aversion to avocado and salad, which made me very sad. I had some nausea and drank a decent amount of Reed's ginger brew, which is sweetened with honey and pineapple juice. I am fortunate enough to be able to make my own schedule and truly admire women who have to plow through the exhaustion while working conventional hours. I found myself craving more animal proteins and I listened to my body. Whole roasted chicken, roasted chicken thighs, and turkey meat sauce started appearing heavily into the meal rotation. I also made sure to eat wild salmon once a week, especially in the third trimester, to help optimize babies' brain development. If I had a craving for a hearty cheesy pasta, I made healthified versions and opted for quinoa or whole grain pasta. There was always a vegetable or two mixed in, such as wilted kale or roasted broccoli or cauliflower. I ate organic full fat dairy and made sure to always include protein, healthy fat, and fiber at all my meals and snacks. I had one cup of coffee a day and had the occasional half glass of wine. When I was feeling like I needed something "mocktaily "or other than water or seltzer, I had Blackberry or Raspberry Spindrift or an Arnold Palmer (lemonade and ice tea), which was especially delicious in the summer months. You can catch my #bumpandbreakfasts on Instagram for an idea of what I ate. Optimizing omega 3's was important for me and babies brain development. I would always add chia and hemp seeds and ground flax seeds to smoothies and would finish greens with cold pressed flax oil. For snacks, my go-to would typically be peanut butter and banana, a handful of roasted almonds, hummus and veggies, plain full fat yogurt with a little maple and cacao nibs, or a piece of organic full fat cheese. If I needed a sweet treat, I would have a a few pieces of Hu Kitchen chocolate or Luna and Larry's Coconut Almond Bars. By the third trimester, I stated to experience heartburn, which I treated with good old fashioned Tum's. I had mixed feelings about taking them, but I would have one every now and again, and it did the trick. I developed a hernia and had to cut back on all my favorite workouts except for yoga. Luckily, I found that the Prenatal Yoga Center provided me with a profound amount of support and knowledge which I carried with me through Jack's delivery. I tried to stick to a diversified and healthy diet as much as possible, since I truly believe good eating habits start developing in vitro. That meant lots of dark leafy greens, berries, bananas, legumes (crispy chickpeas are my favorite and lentil soup) full fat organic dairy, fermented foods, nuts, nut butter, whole grains (quinoa, brown rice, farro), ground flax seeds, chia, and hemp seeds, organic chicken and turkey, and wild salmon. Toward the last month, I slowed down and relaxed a great deal. I got leg cramps in the middle of the night and focused on staying hydrated as much as possible as well as taking Natural Calm every night. I created an evening ritual of a relaxing bath, which I still rely on today, got pedicures, walked a lot, and really tried to provide myself with calm, which I knew would be turned upside down once baby arrived. I started taking a prenatal vitamin before I was pregnant and continue doing so today. I rotated between Rainbow light (which offers 1 pill a day instead of 4) and New Chapter, and now I take Mega Foods Baby & Me. I also took Vitamin D, Omega 3's, and Probiotics. I tried my best not to engross myself in all things baby and pregnancy due to my many miscarriages. That being said, I skimmed/read the little-too-cheery for my taste What To Expect When You Are Expecting (and looked at the app weekly), the super crunchy yet enpowering Ina May's Guide to Childbirth, and listened to Brining Up Bébé autiobook for some educational car entertainment. I took all of my childbirth education classes at the Prenatal Yoga Center as well as the mandatory class at the Birthing Center at Mount Sinai West, which is where Jack was born. I tried my best to stay away from purchasing maternity clothes since I knew I would only wear them for a few months. I got a few big ticket items from Hatch and, for the rest, I just sized up at madewell, Gap, and Athleta. Again, I know I have the luxury of not having to look completely polished and professional all the time, but I still needed clothing that fit. Toward the last month, tying my shoes became very challenging, so I invested in a few slip ons which have been great for heading out the door wearing baby as well. For breastfeeding, I have found that Ingrid and Isabel have sturdy nursing bras, tanks, and sleepwear. Wrap tops and dresses and button downs make breastfeeding more accessible. I try my best to stick to natural skin care lines like Odacite, One Love Organics, and Weleda, so I did not have to change much during my pregnancy. 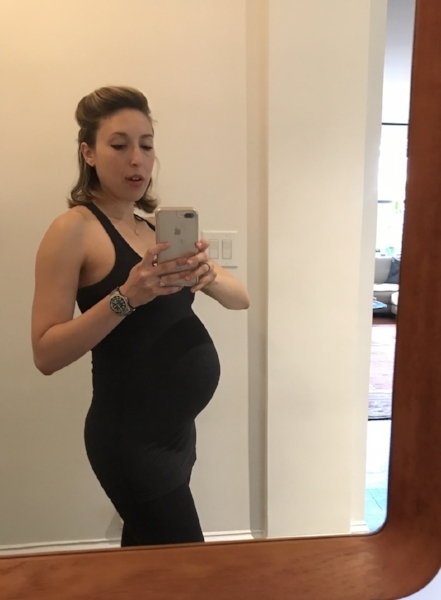 I got oxygen facials from Joanna Vargas once a month and used Weleda stretch mark massage oil and Zoe Organics on my belly, which seemed to do the trick. For more baby/pregnancy/life tips, my friend, Mollie Chen has great taste and advice find her here or here !